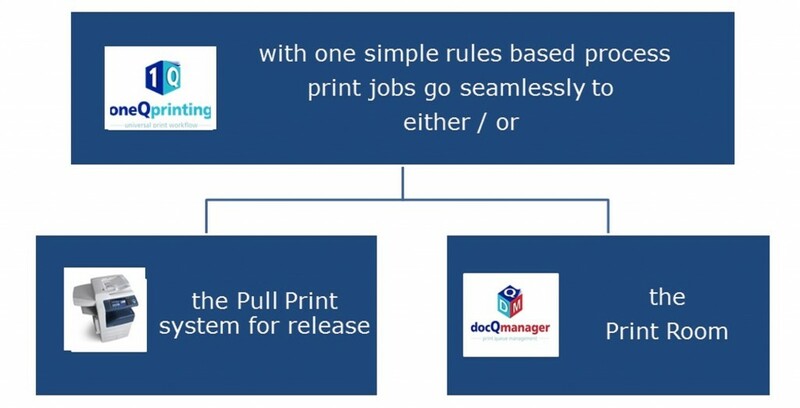 The optimum rules based print process for any organisation with departmental “pull printing” and an in-house print room. Users have only one queue. From the action “file/print” a job ticket is presented for completion in the same way as a print driver. The ticket contains rules, is dynamic in form and shows the user the cost of the job based on the selected output parameters. The default status is to send jobs to the departmental pull print system and in that context the ticket shows the limited form of finishing is available on those MFPs. If, however, the output parameters selected cause the job to exceed the rules limit for departmental printing the ticket notifies the user that it should go to the print room and the ticket dynamically changes to show all the further print options available in the print room, such as binding laminating hole punching, etc. The job ticket is designed to display only what is necessary for the user and avoid the often excessive complexity of modern manufacturers’ print drivers. Rules can be made mandatory or advisory or a combination of both to suit the corporate culture required. Designed as an “open system” the solution works with any Windows supported output device in the print room or on the departmental network and happily works with mixed manufacturer environments if required. The solution can be applied to any new or existing Windows network “Pull Print” system. By providing the rules function it saves on the purchase cost of client software for such systems. It also allows for more complex and sophisticated rules to be applied. ATI solutions integrate with the leading cost recovery systems from Equitrac, PaperCut, Pcounter, Safecom and YSoft SafeQ. Where such job accounting is used with “Pull Print” systems the ATI solution provides full and seamless job accounting into the same cost recovery system whether the job is printed on the departmental MFP or in the central print room. Furthermore, off line costs such as finishing and delivery, may also be costed and reported within the same system. Job ticket design can be customised to suit specific user requirements. Dynamic graphics may be used to illustrate output format selections made , colour or B&W, duplex or simplex, hole punching, stapling, etc. Design and logos can be adopted to match any “house style”.